Here are some pictures the fellowship of the Ring or better, the fellowship of the Ring so far. 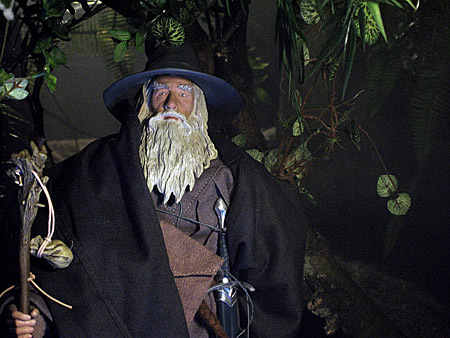 The Toy Biz Gimli filled a gap, but two hobbits are still missing. Will they ever come? 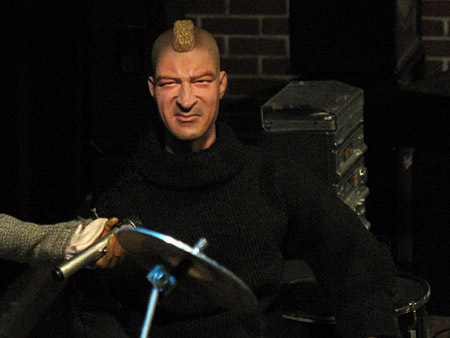 Sideshow…please!!! 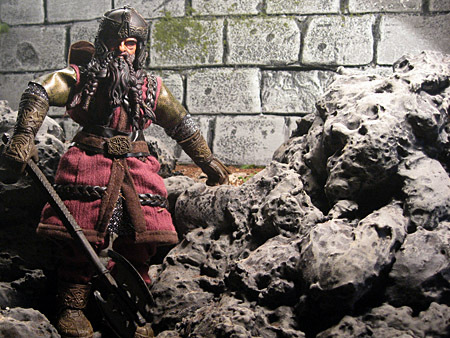 Here are some pictures of my latest Sideshow Lord of the Rings figure. It’s a great head sculpt with a good likeness of Ian McKellen. A couple of days ago I bought the HBO show Rome and as an addition the book about the show. Both are good sources for my upcoming Rome diorama project. 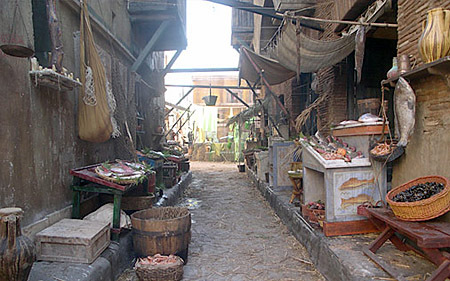 There are a lot of great reference pictures of locations, props and costumes. I really like the show, even though it reminds me sometimes on an ancient version of that Dynasty Denver clan. On the DVDs are some good extras as well, but I haven’t seen them all yet. One very nice feature is the option, to view the episodes with comments on the historical background. A very usefull feature I think. So little by little it becomes more clear how my project will look. It will be a street somewhere in the plebeians quaters. Have a look on the following picture of the fishmarket street of Rome. That will give you an idea of the direction how the diorama will look. Here comes the second part of my little Lord of the Rings update. 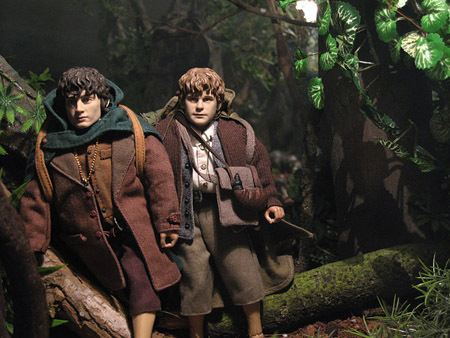 The Sideshow figures Frodo Baggins and Samwise Gamgee. Hey Sideshow, please complete the fellowship! After a busy time with the Behind the Curtains comic I take a little break from the comic stuff, before I start working on the first episode and the sets for it. The next little diorama project will start in a couple of weeks, but first there are some figures on my wishlist, before I start spending money for new diorama material. And I’m running out of bodies. So, no customs at the moment. But in a few weeks it’s Actionfigurado in Duiven and I hope I’ll get some cheap bodies there. 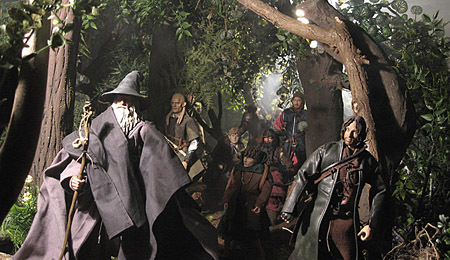 I’m still waiting, that sideshow will continue their LotR serial, but there isn’t much hope for it. 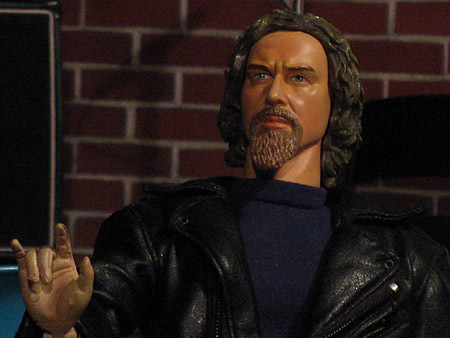 Toy Biz brought us some 1/6 figures as well a couple of years ago. 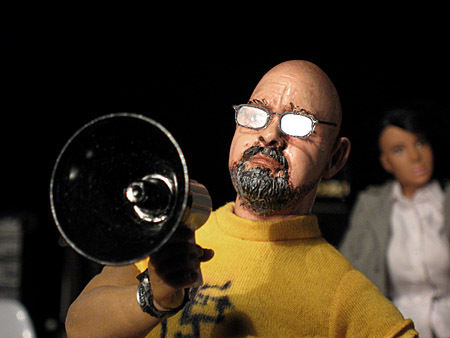 Most of the figures didn’t have any likeness with the movie characters, but some were okay or at least acceptable. 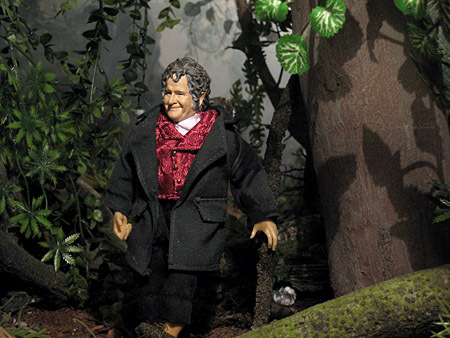 One of those figures was Bilbo Baggins. 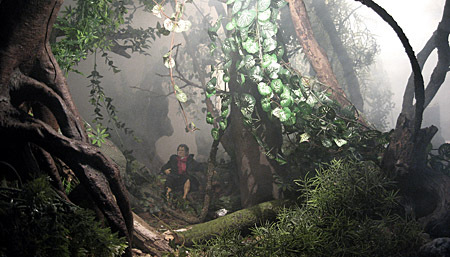 And here he is on his way through a forest not far away from the shire. The English Version of the comic is now available. So, it’s done the last german pages are online now. At the moment I’m working on the english version. There are only four pages left. So it probably will go online tomorrow, or with some good luck already tonight. As always, here are some links to the latest stills. Willy Davenport selling wine, with his bike and on stage. Joe Pushkin in Joe’s garage. And Jimmy Frost playing a Clash song. For the last pages about Jimmy click on the picture. At the end it was really a nip-and-tuck race between Jimmy. Willy and Adriel. If you like to, have a look on the voting statistics. First again some stills. Here is Pizza dude and weed smoker Adriel Jackson. Two new pages are online with the feature on William Davenport and his interview. Click on the picture to go to the update. btw, I started already to work on the english version. It will be online on the weekend. Here are again some stills from our yesterday hero Matthew Doyle. 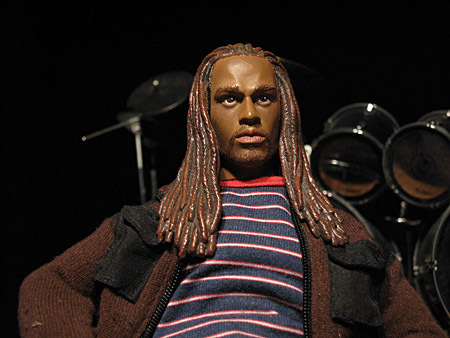 On the bass we find Adriel Jackson. That is my favourite litte chapter of the story. Click on the image for the new pages. You are currently browsing the about my work blog archives for February, 2009.